The 10 HD+ combines a versatile and solid stand with a decently sharp screen, reasonable performance and amazing battery life, but it ends up being big, bulky and a bit pricey for what it offers. It is quite hard to stand out in the mid-range 10-inch Android tablet market, but if anyone has a chance it is Lenovo. Well known for innovative laptop designs and very high quality products, this Chinese powerhouse has found amazing success over the past few years by really pushing what is possible in that traditional form factor. Lenovo has a significant portfolio of mobile phones (sold mostly in China) and is going to be a manufacturer to watch in the coming years, especially as it tries to push into relatively mature Western markets with the acquisition of Motorola. In a clear attempt to bring its core values of innovation, differentiation, and quality to the tablet market, Lenovo launched two Yoga tablets in 2013 to a mixed response. Trading on its almost bullet-proof brand name, these tablets unfortunately lacked in screen quality and performance and came with unattractive software. 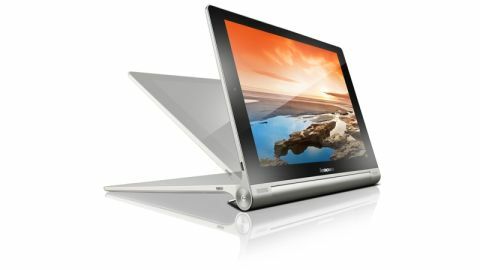 Now though, Lenovo has launched the Yoga 10 HD+ with some serious upgrades in all areas. One thing that didn't change with this second generation device is the design and hardware features, which are easily the most unique you can find on any tablet this side of a Microsoft Surface. In fact, the Yoga tablets share some ideas with the Surface. The Yoga 10 HD+ has a large cylindrical enclosure down one long edge of the tablet, called the battery cylinder, which is where all the magic happens. Firstly, that cylinder holds a huge battery rated at 9000mAh, which gives a capacity of 33.3Wh. By comparison, a Samsung Galaxy Pro 10.1 has a capacity of 30.4Wh. More interestingly though are the other tricks that hide here, and they are the clue as to why Lenovo gave this tablet its Yoga branding. There is a very sturdy small stand that you can roll out by twisting the bottom of the tablet. Once the stand is exposed, the Yoga 10 HD+ can be stood up at almost any angle. Once stood up like that, the Yoga becomes a superb tablet for consuming media on its rather lovely and bright screen. The experience is made even better by the stereo front facing speakers, which go very loud. However, they are not of great quality, lacking bass and distorting slightly at very high volumes. The power button is located on one side of this metallic cylinder and it has a rather subtle LED notification light embedded in the button. It is rather too subtle, bordering on useless, as I have only ever noticed it when trying to find the power button anyway. On the other end is the headphone jack that is actually really well positioned for most uses. Unlike the original Yoga 10, the 1920 x 1200 pixel screen resolution is rather nice. While its sharpness won't compare to an iPad Air 2 or a Samsung Galaxy Tab S, it is still very nice to use and has plenty of brightness, a major upgrade on the old model. The Qualcomm Snapdragon 400 SoC with four cores all clocked at 1.6GHz is also a serious upgrade from the weak processor used last time. This chipset is found in all sorts of devices including the much praised Moto G, but this is the first time I have come across a device asking it to drive such a high resolution screen. It manages this without any notable slow-downs, cementing its reputation as the chipset of choice for the mid-range. Lenovo has also included 2GB of RAM and 16GB of storage in the Yoga 10 HD+ along with microSD card expansion. No corners cut here then. There's an 8MP camera housed on the back of the ever-present cylinder behind the power button. I found this to be a really annoying position, especially for taking landscape orientation pictures where I had to hold the tablet with two hands. But I can let Lenovo off for this one slip up. The 1.6MP front facing camera is mounted at the top of the Yoga 10 HD+ when it is held in portrait orientation. This made video calls with the tablet propped up on its in-built stand quite awkward, something I find harder to forgive. Unfortunately, at launch the Yoga 10 HD+ arrived with Android 4.3 and a rather heavy and clunky Lenovo user interface. There has now been an update taking the tablet to Android 4.4.2 and actually removing a large chunk of Lenovo's customisations, giving the Yoga a nice software build. Kudos to Lenovo for this. So it seems there is not much wrong with the Yoga 10 HD+ but one look at the price can shatter this illusion. At £299 (around US$300, $552) for the Wi-Fi only model reviewed here it is quite expensive compared to other, better-specified, tablets such as the Samsung Galaxy Pro 10.1. It is still cheaper than most high-end Android tablets at this screen size, but it does only have mid-range specs. The 3G model represents better value in my view at £330 (around US$546, AU$607), but can either model really compete for honours in this class?